A few days later, I had my own pretty significant scoop, in which I acquired internal CMS documents which proved that while the 90% cut in the ad budget might have been planned earlier, the 40% navigator/outreach organization grant cut was literally done at the last minute, with $60 million in grant contracts mere hours away from being delivered to the recipients when the plug was pulled on them. Navigator grantees expected that their new, smaller budgets for 2018 would follow that August 31 announcement because the 2017 budget was set to run out September 1. Friedsam, who runs Wisconsin’s largest navigator grant, says that her group exceeded its enrollment targets. This means that they should be safe from any budget cuts, which administration officials say will target underperforming organizations. Still, she found herself handing out 10 layoff notices to staff because she doesn’t currently have any funding stream. She worries that, by time the funding does arrive, she won’t be able to recruit those people back. In short, the Trump Administration is doing everything in their power to bog down, slow down, obstruct, screw up, gum up and generally sabotage the Open Enrollment effort, and is doing so in the most blatantly obvious ways. There's not much in the way of silver linings to be found here, but there's some good news. For one thing, the 12 state-base exchanges, including the largest state (California), all have their own full-blown advertising and outreach budgets, so shouldn't be impacted nearly as much by the federal sabotage as the states on the federal exchange will be. 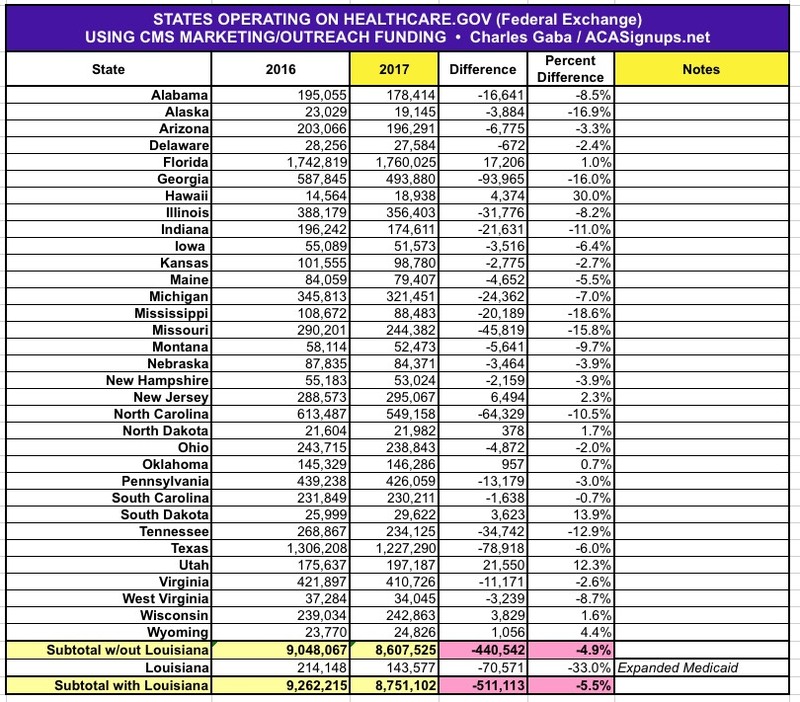 Don't get me wrong, there will be some drag on enrollment due to Trump/Price's efforts, because if someone from one of those states does visit HealthCare.Gov, they get redirected to the appropriate exchange site after entering their zip code...but the impact should mostly be mitigated in those states. In addition, there's already a massive grassroots effort sprouting up from groups like Indivisible, MoveOn, the Women's March and so forth to get the word out to as many people as possible in spite of Trump's attempts to bury Open Enrollment this go around. Case in point: The Indivisible ACA Signup Project, which I'm a proud member of (as you'd guess) and which ACA Signups will be announcing more about later this week (stay tuned). Well, here's a little more good news: There's at least one more state exchange...and potentially up to five of them...which will also be running their own advertising/outreach effort with their own funds. "Federally-facilitated Marketplace": 28 states. These exchanges are run via HealthCare.Gov and are entirely managed via the HHS Dept. "State-Partnership Marketplace": 6 states. Plan management for these states is run by a state board of directors, but otherwise they're run through HC.gov. From a marketing/outreach POV, all 34 states in these categories are effectively at the mercy of the sabotage efforts above. "State-Based Marketplace": 11 states + DC. These are the ones noted above: California, New York, Connecticut and so on, which run pretty much everything themselves, on their own tech platform (i.e., their own websites). "State-based Marketplace-Federal Platform": These are similar, structurally and legally, to state-based marketplaces, but with one critical difference: They utilize the federal technology platform for actual enrollments (i.e., HealthCare.Gov). Three of these states (KY, NV & OR) used to have their own websites, but Nevada & Oregon's sites had too many technical problems, so they scrapped them and have piggybacked on HC.gov ever since. Kentucky's website, "kynect", worked very well and had a fantastic branding/marketing campaign...but new Republican Governor Matt Bevin decided to scrap it for no good reason, so it shifted to HC.gov last year. Finally, Arkansas and New Mexico were supposed to move off of HC.gov onto their own full exchange websites at some point or another, but both states basically changed their mind and decided to stay put on the mothership for the time being. The Trump administration’s massive cutback on advertising and outreach for the upcoming health insurance enrollment period won’t have a huge effect in Oregon. That’s because here, the money for those efforts comes from the state, not federal government. States have devised a number of ways to enroll people in health insurance through the Affordable Care Act. Oregon operates under what’s known as a state-based marketplace that uses the federal enrollment platform. That means the state is in charge of getting the word out and helping people enroll, but Oregonians still sign up through HealthCare.gov. The funding in Oregon comes from a $6 per-member, per-month fee on health insurers for every medical policy sold via HealthCare.gov and 57 cents for every dental policy. That’s expected to amount to $9.25 million this year. Four other states — Arkansas, Kentucky, Nevada and New Mexico — operated under the same format as of January, according to the Kaiser Family Foundation. Now, this doesn't mean that the HC.gov cuts won't have any impact on these states. Again, you still have to visit HC.gov in order to actually enroll in an ACA policy, so this will have some negative effect...but instead of 12 states with their own marketing budgets, it's actually 17 of them, which should help mitigate the damage to some degree. In previous years, Oregon has benefited from federally funded HealthCare.gov commercials and other ads that appear in the state, but those won’t happen this year, Cronen said. Given the cut in federal ad spending, Oregon’s Health Insurance Marketplace is considering spending more on ads, but a final decision hasn’t been made, Cronen said. The state marketplace handed out $275,000 in grants to insurance agencies around the state, including four in Central Oregon, to spread the word about enrollment. Last year, the Marketplace gave $350,000 to insurance agencies. On the Federal Exchange, removing these 5 states actually makes the year over year drop-off worse than it was previously, going from a 4.7% drop (5.3% with Louisiana included) to 4.9% / 5.5%. 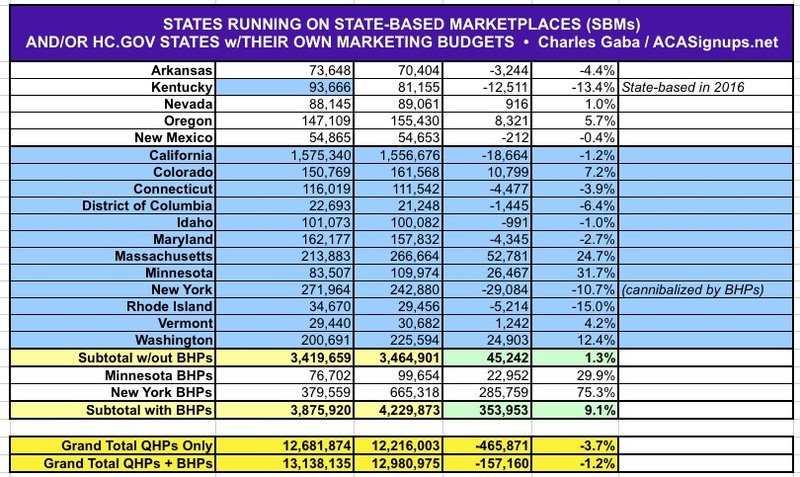 Interestingly, at the same time, the "ran their own marketing budget" states (SBMs plus the 5 "piggyback on HC.gov" states) also looks a bit worse: Instead of a 1.8% increase (10.6% with BHPs included), they now only saw a 1.3% bump (9.1% with BHPs). Even with these shifts, the overall year over year drop is still identical, of course (3.7% nationally, or 1.2% with BHPs added). No matter how you slice it, killing the federal marketplace ads hurts, while running a full ad campaign makes a significant positive difference.